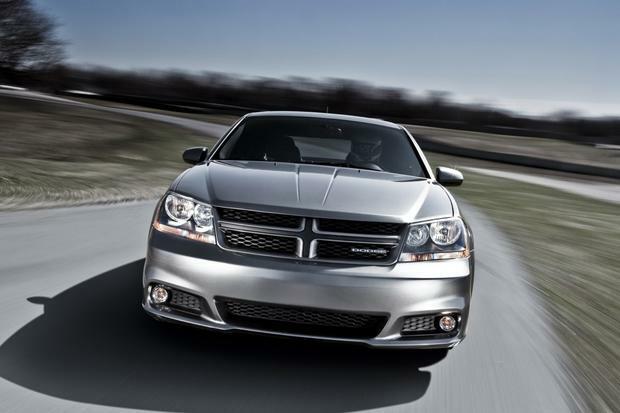 Dodge's midsize Avenger sedan and the once-popular Chrysler 200 Convertible will soon be canceled. 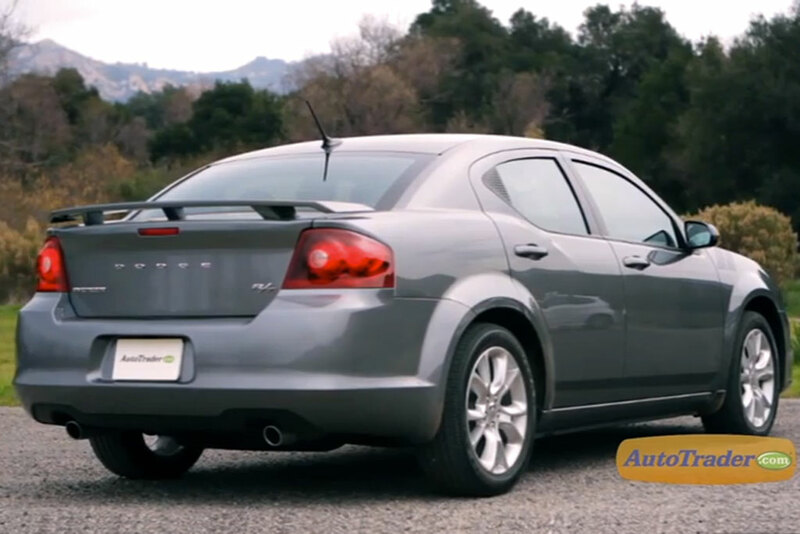 This is a full new car review of the 2013 Dodge Avenger sedan. While the Avenger isn't the roomiest midsize on the road, it can more than hold its own in this very competitive category. 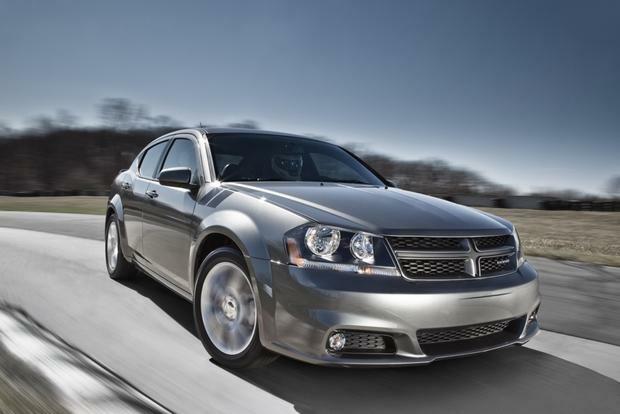 First, the good news: The 2014 Dodge Avenger is a very affordable, midsize sedan that has come a long way from the horrible car it was from 2008 to 2010, thanks to a heroic rejuvenation for 2011. Interior quality is quite respectable, ride and handling are refined and the available 3.6-liter V6 delivers satisfying power at a very reasonable price. The bad news? Its fundamental design and shape have remained more or less unchanged, while most of its competition has been redesigned. Thus, for 2014, it remains far from the head of the class in any measure except for value and the power of its available V6 engine. The Avenger is unchanged for the 2014 model year. The base Avenger SE model comes with a 4-speed automatic transmission and a 2.4-liter inline-4 rated at 173 horsepower and 166 lb-ft of torque. The engine is OK, but we think this transmission is among the worst in the family-sedan class. 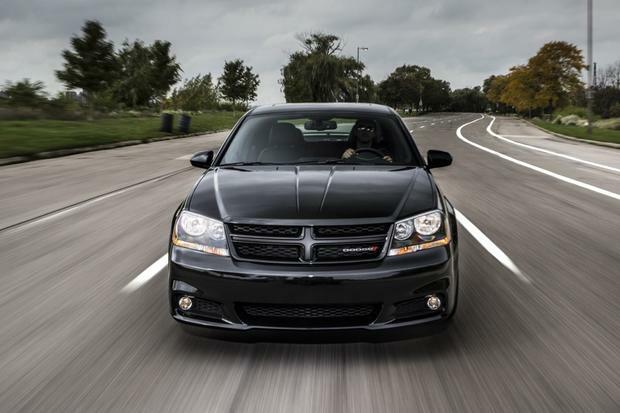 We recommend stepping up to the SXT, SE V6 or the R/T, all of which use a relatively smooth 6-speed automatic instead. Acceleration is acceptable with the 4-cylinder, but fuel economy is unfortunately below average with either transmission: The 4-speed yields 21 miles per gallon city and 30 mpg highway, while the 6-speed surprisingly does about the same at 20 mpg city/31 mpg hwy. As for the optional 3.6-liter V6 (standard on the R/T), it's a beast. It cranks out 283 hp and 260 lb-ft of torque through a 6-speed automatic. For people who want a little extra oomph, the V6-powered Avenger is one of the best values out there -- and the 6-cylinder returns nearly the same gas mileage as the 4-cylinder models, checking in at 19 mpg city/29 mpg hwy. 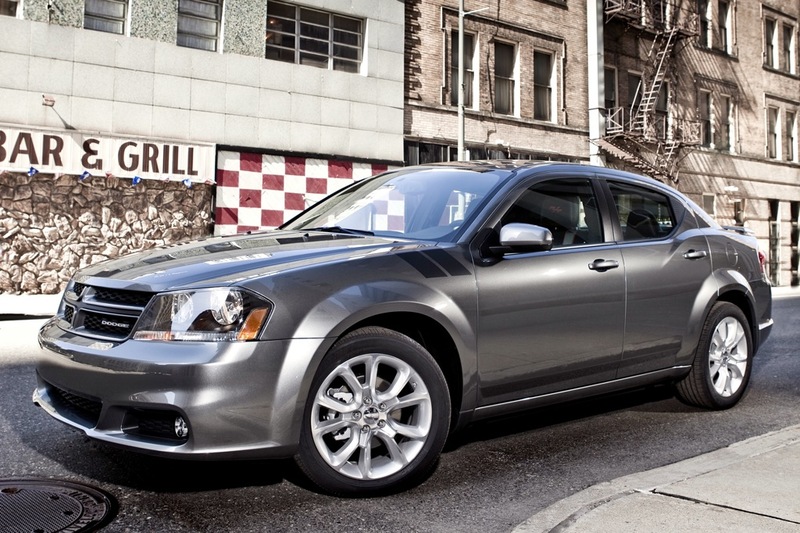 The 2014 Dodge Avenger comes in four trim levels: SE, SE V6, SXT and R/T. The just-the-basics Avenger SE ($20,500) features a 4-cylinder engine, 17-inch steel wheels with plastic covers, power accessories, cruise control and a 4-speaker audio system with an auxiliary input jack (but not a USB input). The Avenger SE V6 ($22,200) adds a 283-hp V6, a 6-speed automatic transmission, a rear spoiler, 17-in aluminum wheels and dual exhaust tips. For the same price as the SE V6, the Avenger SXT ($22,200) reverts to the base model's 4-cylinder engine, but it adds the superior 6-speed automatic transmission. 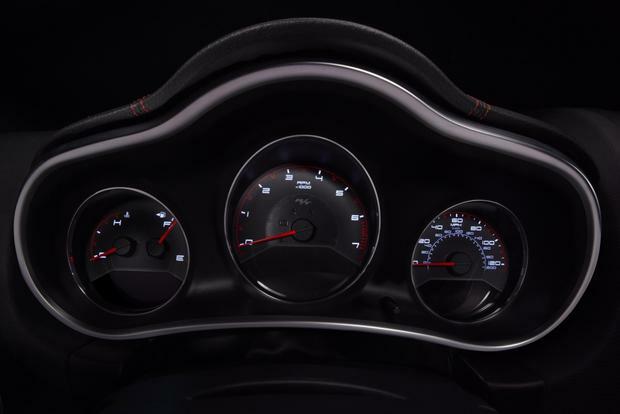 The SXT model also has 17-in alloy wheels, a power driver's seat, a 6-speaker stereo, satellite radio, automatic climate control, fog lamps and a leather-wrapped shift knob and steering wheel. A Rallye Appearance package ($495) tacks on 18-in alloys, body color grille and rear spoiler, darkened headlamp bezels and unique seat fabric. A Blacktop package ($595) also adds darkened headlamps, bundled with black-painted 18-in wheels and a black grille. 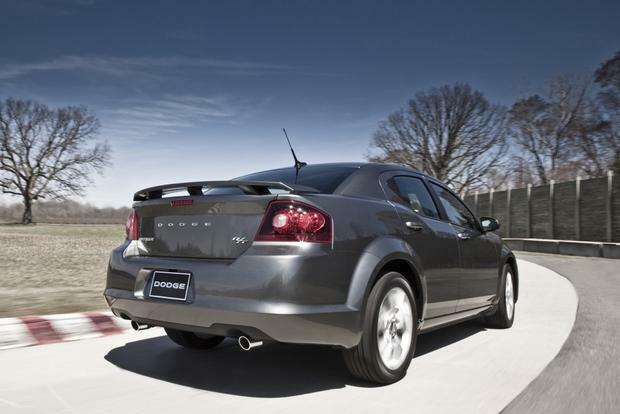 You can add the V6 to the SXT for $1,795. Incidentally, adding leather to the SXT for $595 makes it America's cheapest midsize sedan with leather upholstery. The Avenger R/T ($26,400) receives its own 18-in polished alloy wheels, sport-tuned suspension, various sport-themed styling cues, jazzed-up seats with leather bolsters, red LED ambient lighting, remote start, Bluetooth connectivity, Boston Acoustics speakers and an exclusive gauge cluster with a center-mounted tachometer. Of course, it also includes the V6 as standard equipment. 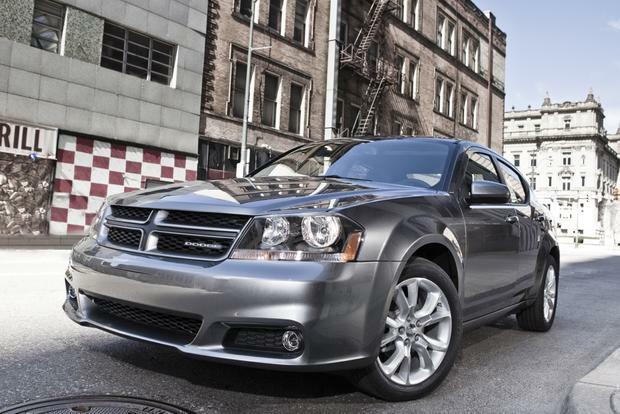 The 2014 Dodge Avenger comes with standard stability control, 4-wheel anti-lock disc brakes and six airbags (front, front side, full-length side curtain). In government crash testing, the Avenger received an overall rating of four stars out of five, while the independent Insurance Institute for Highway Safety gave the Avenger its top rating of Good in every category. The Avenger is a relatively pleasant car to drive. Quiet and soft (except for the firmer R/T with its 18-in wheels), yet surprisingly coordinated in corners, the Avenger strikes a good, dynamic balance for American roads and reflects the Dodge brand's accent on performance. Easily the most memorable aspect of the driving experience is the thrust from that powerful optional V6, which transforms the Avenger into a little muscle car that's totally worthy of its Charger-inspired styling. Kia Optima -- The boldly styled Kia Optima has superior fuel economy and a bigger backseat, yet it's still aggressively priced even with the optional turbocharged inline-4. Chevrolet Malibu -- The Chevrolet Malibu offers fresh interior and exterior design, high feature content (including OnStar telematics) and excellent fuel economy, all for about the same price as the Avenger SXT. Like the Kia Optima, Chevrolet is offering a turbocharged inline-4 instead of an optional V6 for performance-minded customers. Toyota Camry -- The Toyota Camry has great fuel economy, plenty of space all around and few notable flaws. The V6-powered Camry SE is even fun to drive this time around, easily giving the Avenger R/T a run for its money, while matching the 4-cylinder Avenger's fuel economy. Considering how inexpensive the Avenger line is, we think upgrading to a V6-powered model is clearly the way to go, even if it costs you a little more up front. The R/T is an acquired taste, however, with its boy-racer styling cues, so we'd stick with the SXT Plus and enjoy the money we saved over rival V6-powered sedans.